Last year, the Zimbabwe Conservation Task Force reported that a number of baby elephants aged two and five years old had been abducted from Hwange National Park. Earlier this year, twenty-four were shipped to China to perform circus-like acts for the public; 170 more are currently waiting to join them. As justification, Zimbabwean lawmakers claim the elephants are disturbing their neighbors, eating too much food, and are a threat to the economy. To rectify these apparently horrendous crimes, the government has decided to sell the elephant calves into slavery — to live out the rest of their lives as objects of entertainment. Each elephant is being sold by the Zimbabwean government for about $40,000 — a small price for the lives of some of the most caring sentient beings on the planet. The Convention on International Trade in Endangered Species of Wild Fauna and Flora (CITES) Secretariat has stated, "[T]he export would not be detrimental to the survival of the species in the wild." However, since the forest-dwelling and savannah elephants of Africa are still classified as a single species by the IUCN — despite evidence suggesting they are genetically distinct — the statement by CITES is based in conjecture and not fact. Tell CITES Secretary-General John E. Scanlon to retract his approval of this trade, and postpone any decision on African elephants until the IUCN has re-evaluated the species status of African elephants. Thank you for the important work you do with regard to the conservation of endangered species. The CITES Secretariat has proven itself integral to the continued survival of earth's animals, making it one of the most important organizations currently in operation. 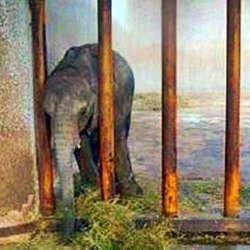 However, your recent decision to allow the capture, sale, and exploitation of nearly 200 Zimbabwean elephant calves has raised significant concern among conservationists. According to the CITES report on the decision, the move will not have a significant impact on the African elephant "species." The Secretariat presumably reached this conclusion based on the IUCN's current assessment of the African elephant's conservation status. Yet the IUCN listing for Loxodonta africana also contains a taxonomic note: "Preliminary genetic evidence suggests that there may be at least two species of African elephant... [and a] third species... has also been postulated." The IUCN claims that more research is required before re-classification of the African elephant, and therefore the current assessment includes all elephant populations in Africa. I understand that the large population size of Zimbabwean elephants can make it difficult to see how removing a couple hundred individuals would make a significant impact. However, the second-greatest threat to Zimbabwe's elephants after poachers is the misclassification, and subsequent misinterpretation of the existential danger these animals face. Since we do not currently know how many of each species of African elephant currently live where, it is impossible to definitively say that relocating any will not endanger the survival of one species or the other. Therefore, I insist that you withdrawal your approval of the Zimbabwe government's sale of kidnapped baby elephants. Not only is the enslavement of these calves ethically egregious, but (as far as we know) by allowing this travesty you may be facilitating the extinction of an entire species of elephant. That's 40,857 signatures! Let's keep the ball rolling.